SGA legislators met Nov. 7 to confirm Konya Badsa (15Ox, 18C) as vice president of communications, establish a new Communications Committee and fund Thanksgiving airport shuttles and Refugee Revive and TableTalk’s “Dinner Syries.”/Ayushi Agarwal, Contributing Photographer. 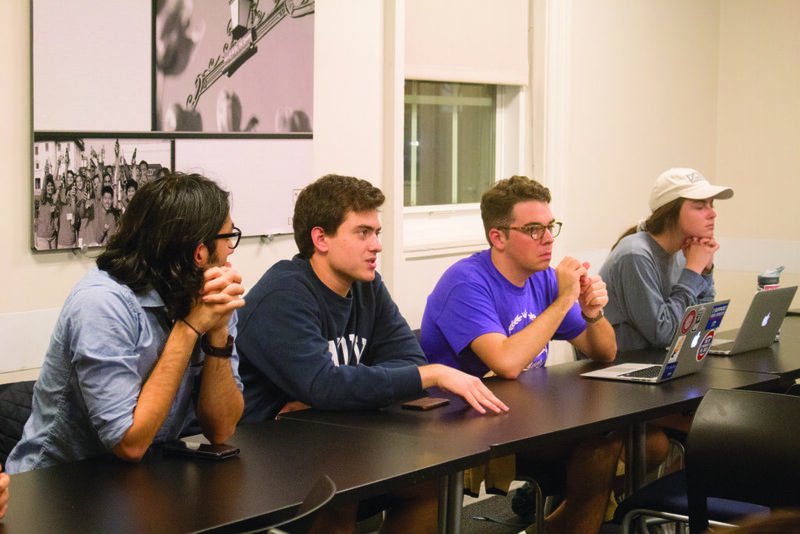 The 51st legislature of the Student Government Association (SGA) convened Monday to confirm a new vice president of communication and vote on bills that would establish a new Communications Committee and fund the Refugee Revive and TableTalk’s “Dinner Syries” and Thanksgiving airport shuttles. All bills were passed. SGA President Gurbani Singh (18B), Executive Vice President Natasha Armstrong (18B) and Chief of Staff Mario Karras (17Ox, 19B) proposed Bill 51sl29 to confirm Konya Badsa (15Ox, 18C) as vice president of communications. Badsa previously served as Oxford SGA’s public relations chair. Karras said Badsa effectively communicated between the Oxford SGA administration and Oxford community members, especially after a mass shooting threat through Yik Yak at Oxford caused panic during Fall break in 2015. The bill passed with 13 votes in favor and one abstention. Freshman Representative Austin Graham (21C) abstained from voting. When asked why he abstained, Graham told the Wheel he did not agree with the lack of transparency between legislators during the application process, but was not against Badsa becoming VP of communications. The VP of communications is an executive position and selected by the SGA president, according to Section Three of the SGA Constitution. Singh told the Wheel she chose Badsa with the input of Armstrong and Karras. Bill 51sl31, proposed by Singh, Armstrong, Karras, College Junior Representative Madelyn Zapata (19C) and College Sophomore Representative Johnna Gadomski (20C), proposed to form the Communications Committee. The committee would be chaired by Badsa and includes two other positions: chair of graphic design and video and chair of community outreach. Both positions would be filled from the applicant pool for VP of communications. Singh, Armstrong and Karras will also select the applicants for the positions. Singh explained that the SGA communications needed updates that would require more work than appropriate for just one person, the VP of communications. The bill passed with 13 votes and one abstention. Graham again abstained because he wanted more transparency in the process of choosing committee members. Legislatures were not made aware of the other VP of communications applicants, Graham told the Wheel. Gadomski and Graham proposed Bill 51sl30, which would allocate $3,500 to airport shuttles during Thanksgiving break. Three shuttles would run hourly Nov. 21 from 3 p.m. to 6 p.m. and Nov. 22 from 5 a.m. to 10 a.m. Each shuttle holds 50 students and would take students from Emory to Hartsfield-Jackson Atlanta International Airport. Singh said the Graduate Student Government Association (GSGA) told her if graduate students used the shuttles, GSGA would fund up to the percentage of how many graduate students used the service, so the $3,500 amount is subject to change, depending on the number of graduate students who use the service. Students would sign up for the shuttles on OrgSync. The bill passed with 13 votes and one abstention. BBA-wide Representative Max Renke (19B) told the Wheel he abstained because he believed that the time slots for the shuttles should have been better determined. “I’m not American so I don’t understand Thanksgiving, so I just didn’t want to do anything with it,” Renke said. After the SGA meeting, Singh confirmed that there will be a survey sent out before the holiday to undergraduate students to gauge the best times for the shuttles to run. The bill authors did not mention a survey during the presentation of the bill. President of TableTalk Helena Zhao (19C) proposed Bill 51sl28 to fund Refugee Revive and TableTalk’s Dinner Syries events. The dinner is scheduled to take Emory students to a Syrian refugee family’s house. The family primarily makes its income by preparing and serving meals. Zhao described the event as “an opportunity to participate in [a] unique cultural exchange.” The bill requested $375 to fund a Nov. 7 dinner for 15 people and Nov. 8 dinner for 10 people. The cost of each person’s dinner is $15. The bill passed unanimously with 14 votes. This was the first meeting where all 15 legislators were present and voting, according to Speaker of the Legislature and Senior Representative William Palmer (18C).